My great aunt Alice was born in 1882 and when I painted her house in 1965 she was 83 years old. I was in college and my great aunt lived in a house owned by my aunt. My aunt hired me to paint the living and dining rooms of the house. It took me quite awhile as the plaster needed a lot of repair work. Every day my great aunt Alice would make coffee. It was strong enough to remove rust but it was good and smelled wonderful. When I think of old people I think of fresh paint and lovely coffee. Some people think old people smell bad. I wonder why? For those of us who have visited in nursing homes one does notice that the smells are quite distinctive and often unpleasant. I think that set of smells is due to the location and circumstances not some inherent shortcoming of being old. It turns out people do smell different at different ages. Mitro et al (2012) did a study where a set of judges smelled young, middle aged and old people and were able to distinguish among them. Actually to keep the judges unaware of who they were smelling, they smelt sweaty underarm pads. A bit gross but at least anonymous. This study was discussed on Fox News and they reported that no age group smelled bad just that the groups smelled different. Finally, another study by Distel & Hudson (2001) looked at the power of suggestion on the perception of an odor. If subjects just smelled something without knowing what it was they tended to have neutral opinions. If subject were informed of the nature of the odor they held stronger and more focused opinions. Thus, it would seem that what we believe about something influences our perception of it. I like the smell of fresh coffee on a Summer’s morning. 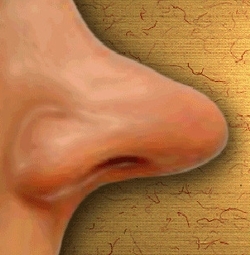 Adapted from the iPhone/iPad application “Try My Nose” by Morgan Marion. I really like this one. The sense of smell is incredibly powerful in recalling old memories locked away. I had to laugh, though, wondering if those underarm pads didn’t just have a selection of men’s deodorant on them. Science wouldn’t do that, but it did make me laugh.